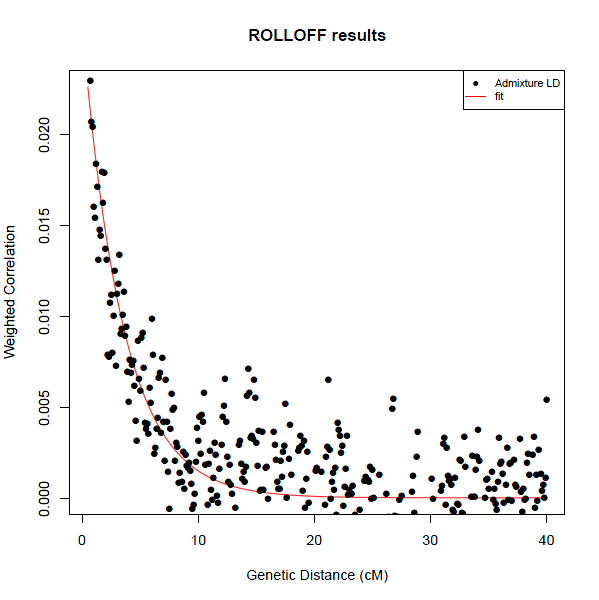 I carried out rolloff analysis of the Behar et al. (2010) sample of Turks together with the sample of Uzbeks from the same, and the Yunusbayev et al. (2011) sample of Armenians. A --geno 0.03 flag was applied for merging and SNPs available in the Rutgers recombination map for Illumina chips were used. The signal of admixture seems pretty clear and extends up to several cM. Of course, as always, this does not mean that exactly these two populations mixed to form the Turks sample, but it does mean that they are reasonable standins. The jackknife gives an admixture time estimate of 27.622 +/- 5.348 generations or 800 +/- 160 years, which of course makes perfect historical sense as it is a date between the first arrival of the Seljuks in Anatolia and the final consolidation of power by the Ottomans. Note also that this probably applies principally to this particular sample (which I believe is from Cappadoccia) and there were perhaps different admixture dynamics elsewhere. Pre-test: Does Turks have a 1-ref weighted LD curve with Armenians_Y? Pre-test: Does Turks have a 1-ref weighted LD curve with Uzbeks? Does Turks have a 2-ref weighted LD curve with Armenians_Y and Uzbeks? Do 2-ref and 1-ref curves have consistent decay rates? Also, if a reference A' shares some of the same admixture history as C or is simply very closely related to C, the pre-test will typically identify long-range correlated LD and deem A' an unsuitable reference to use for testing admixture. In our case, A'=Armenians and C=Turks. We can be fairly sure that Armenians lack the same admixture history as Turks (because they were not affected by Central Asian Turkic invasions), but we can try a 1-ref analysis of Armenians with Uzbeks to substantiate it. The admixture lower bound estimate is a huge interval 7.6 +/- 88.2 and the jackknife is unable to estimate the admixture time. Thus, more plausibly, the second explanation applies, and because Armenians_Y are very closely related to Turks, they are deemed as an inappropriate reference to test admixture. This is a very interesting number. We can be fairly sure that Central Asian Turkic people who invaded Anatolia carried with them an East Eurasian component, but in what proportion to their West Eurasian one? The East Eurasian element in Turks has been rather consistently estimated at ~5-7% with various methods, so perhaps this formed the minority element in the Turkic people who arrived in Anatolia. The age estimate for this is ~16 +/- 2 generations = 460 +/- 60 years. Very similar time estimates appear when Armenians are used as a West Eurasian reference. So, this might indicate that the Uzbek population was formed by admixture after the Anatolian Turks were so formed. I see no easy way to solve the problem of estimating admixture proportions when both extant populations have been both donors and recipients of gene flow, but in any case, these numbers are something to think about. I subsequently formed a new dataset by merging the sample of Turks with a variety of Turkic and East Asian populations (same procedure for SNP choice). For the calendar year calculation, I arbitrarily set the birthdate of the modern sampled individuals at 1980; I have no idea on the age profile of the individuals comprising the Behar et al. sample of Turks. I have also used a mindis=0.5cM which facilitated the convenient automated extraction of the dates from the ALDER output and also gave a level playing field for all the reference populations. The age picked by ALDER using its own adaptive threshold did not usually differ from the reported one by more than a few generations. The % of admixture depends on the choice of population, with highest amount using Uzbeks as a reference, and lowest using the far Asian populations from China. This indicates our uncertainty regarding the East/West Eurasian-ness of the people who settled in Anatolia. Admixture times, on the other hand appear to be fairly constant and appear to frame an important watershed moment of Anatolian history, the Battle of Manzikert which paved the way for the eventual Turkification of the peninsula. The Turkmen sample appears as an outlier in this respect, which might indicate that limited migration of Turkmen tribes may have occurred at a later date. We know of no Armenian/Anatolian/Iranian migration to Uzbekistan in the last 500 years. However we know of a Turkic migration to Anatolia in the last 1000 years. The fact that using Uzbeks as a source population gives us a time around Manzikert +200 years or so expansion time is quite amazing. I'd say the more weird thing is the result regarding Turkmens. I wonder if this is so because Turkmens are more similar to Anatolians and the software assigns a much more recent admixture time and as a result a smaller admixture ratio. I think that is what is going on. I think one way admixture between Turkmens and Turks may yield results that would make using Turkmens as a source for Turks not appropriate. If you look even Altaians have a higher genetic impact on Turks of Anatolia which simply can not be true. I think Turkmens and Turks of Turkey are way too similar for ALDER. 460 years for Uzbeks' admixture makes sense. The end of 15th - beginning of 16th century is the time of big migration of Qipchak (Turkic) tribes from what now Astrakhan oblast of Russia, West Kazakhstan, Central Kazakhstan south to modern Uzbekistan. From historical point of view, there should more admixture events for Uzbeks, one of them from Arabs from 8-9 century AD. Government statistics dating from 1992 show that the population of approximately 23 million is about 71 percent Uzbeks, 8 percent Russians, 5 percent Tajiks, 4 percent Tatars, and 3 percent Kazakhs, with many other ethnic groups represented. The statistics may underestimate the actual number of ethnic Tajiks. The figures also do not include many ethnic Tajiks whose mother tongue was Uzbek. Moreover, some Tajiks choose for a variety of reasons to declare themselves to be ethnic Uzbeks. Libya are you also called onur? Anatolian Turks are as much Siberian as Turkmenistan Turkmens in Aydin and about half in Istanbul. Rolloff and Alder pick up a migration wave between 1070 and 1270 and then a continuous migration until late 1500's. A rapid migration would be confined to a military conquest. However there is more East Asian mtDNA in Anatolia than there is East Asian y-DNA suggesting Turkic families migrated to Anatolia not Turkic men. Uzbeks are 40+% Siberian and East Asian. They have picked up not only West Asian in Uzbekistan but also additional East Asian, too. Using them as a proxy for incoming Anatolian Turkomans was up until this day acceptable to you, Dienekes and everyone else as it was proving Anatolia was 1/7 Turkic. Now that rolloff and alder suggest at the minimum a 30% Uzbek like Turkic group entered Anatolia in the 11th through 13th centuries somehow now makes Uzbeks not acceptable. I don't get this. I think it is useless to attack the Turkishness of Anatolia this much. It is clear that the Turkification of Anatolia at least in the pre 1500 regions of Anatolia happened via population admixture of a huge incoming Turkic immigrant wave. I believe this percentage to be closer to 50% in areas such as Aydin, 30-50% in Central and Mediterranean Anatolia, 30% or so in Istanbul and Northern Balkans (Northern Greece, Bulgaria) but 10-20% in Southern Greece and Northeastern Anatolia. This one can understand by looking at Siberian percentages in these areas. Southeastern Anatolia is a different story. We lost the Turkish population there to Iran. Why fight rolloff and alder only in the case of Turks but no one else. 1. You can not infer the Turkic migrations to Anatolia from Y-DNA and mtDNA. My great aunt who has H mtDNA is 10+% Far Asian, more than Turkmens and my grandpa who is about 10% Siberian is I1*. 2. You can not infer Turkic migrations to Anatolia by comparing Anatolian Turks to Kirgiz. Oghuz Turks have mixed with West Asians for a long time. Uzbeks, Turkmens as well as Azeri, Anatolian, Balkan and other Ottoman Turks trace roots to Oghuz. Incoming Turkic tribes came to Anatolia from Iran, Turkmenistan. Assuming an Uzbek like incoming population in 1070 is an over estimation of their Siberian content. 3. A 200 year migration period of Uzbek like Turks suggests a 30% Turkic immigration to Anatolia. If we model a small immigration per year but a steady one we might get even a higher % of Turkic immigrants. I have no interest in "attacking" anything. I could turn your argument on its head, and say that until I posted this experiment you always complained that I shouldn't be using Uzbeks and I should be using Turkmen. Now that the admixture using an Uzbek sample is higher than that using a Turkmen one, you apparently have decided that the admixture proportion using Uzbeks is more reliable than using Turkmen. I post all experiments as they are, and they can be repeated or re-interpreted by anyone interested to do so. With respect to the substantive part of the issue, I have also posted evidence that Uzbeks have recent West Eurasian admixture, which took place a few centuries after the Seljuqs arrived in Anatolia. In fact, most Altaic populations that I experimented on seem to have that type of admixture. This means that when the Seljuqs arrived in Anatolia, the various Altaic populations living in Central Asia had not yet been formed in their current form by mixing with West Eurasians, and, consequently, they were more East Eurasian than they are today. No, as is clear from my writings, I am not libya. libya = lars = ashraf = aynakom bilibyanalanamihan = Van Hooijdonk = Colin Wilson = pier van lancaster (some of these user accounts may have fallen into disuse or deleted). My sole username is Onur (it is also my real name). It was previously written with a lowercase initial letter, but I later converted the initial letter to an uppercase letter. You keep repeating your step-by-step (first into Greater Iran and after several centuries of mixing there into Anatolia) and centuries-long Turkic migration theory, which lacks historical support. In reality, Anatolia was colonized by the Turkic migrants concurrently with Greater Iran (including what is now Turkmenistan and Uzbekistan) from what is now the middle parts of Kazakhstan (from around the Aral Sea area) during the late 11th and early 12th centuries at the height of the Great Seljuq rule in Greater Iran and the northern Arabic-speaking lands. Turkmens of today cannot be used as a proxy for the Turkic colonizers of Anatolia due to the centuries-long mixing of the Turkic colonizers of what is now Turkmenistan with the Iranic-speaking natives during the last about 1000 years after the Turkic colonization of Anatolia. The ADMIXTURE component distribution of Turkmens too does not support the use of them as a proxy for the Turkic colonizers of Anatolia, as ADMIXTURE component distributions of Turks and Turkmens have no order between each other so that there is no way to derive Turks from the admixture of a Turkmen-like population with a Greek or Armenian-like population (or with an Iranian-like population BTW). As for Uzbeks and Uyghurs, their ALDER analysis results show that a substantial part of their Caucasoid ancestry comes from mixing with non-Turkic natives of Central Asia during the post-Seljuqid centuries. It seems that during the Seljuqid period the Turkic populations of Central Asia had more Mongoloid ancestry than they have today. This is quite undestandable, as back then many parts of Central Asia, especially those in the south, were populated by Iranic-speaking populations. It would be interesting to test for flow into Italians from Greeks and Anatolians. Also for flow into Northern Cypriots from Southern Cypriots and Turks. Dienekes, any chance you could run this analysis with the Balkans and other parts of Europe + Anatolia + Caucasus? There is a significant problem in your inference that major admixture happened in Central Asia after Turks arrived in Anatolia. The Alder and rolloff analysis suggests a roughly 12.6% Altaian admixture in Anatolia but only 10.8% Turkmen admixture in Anatolia. If admixture happened in Central Asia post 1100's did this not happen in Turkmenistan? How come the Turkmen admixture is smaller than Altaian admixture? And what about Uyghur admixture being 23.5% and Uzbek 30%. Are you seriously claiming that whatever admixture happened in Central Asia did affect only Uzbeks and Uyghurs and that this admix had common roots with Anatolia but that this somehow skipped Turkmenistan? The Turkmens_Y are a recently East/West Eurasian mixed population, over the last 600 years or so. In general, there are no good references for the Central Asian ancestors of the Anatolian Turks; all extant Altaic groups of Central Asia/Siberia show evidence of more recent admixture. Has that recent admixture in the extant Altaic groups of Central Asia/Siberia rendered them more Caucasoid or more Mongoloid than they were during the Seljuqid times and before? Also, which extant population do you think is the best reference for the Central Asian ancestors of Anatolian Turks? That is hard to tell, but given that the expansion of Turkic languages followed an east-west trajectory, I'd think that the main trend would be increasing West Eurasian admixture. There is also the recent north-south trajectory (towards then Indo-European - mainly Iranic - lands), which also must have increased the Caucasoid admixture in many Altaic groups of Central Asia during the last 1000 years. -If there was indeed a change of genetic characteristic in Central Asia could this have been more Asiatic in nature rather than Caucasian? There is however an important mystery. According to Wells et al. (2001) Kazakh males are 66% Y-DNA C.
Is it possible that, whatever immigration happened in Central Asia, after the Turkic invasion of Anatolia could have been Asiatic in nature, via the Mongols? And is it then possible to say that Turkic peoples had long had lower Asiatic genetic input? I think this is a question that needs to be considered and if the answer is yes, then the minimum 30% Uzbek input calculated by Rolloff may even be more in terms of the Turkic genetic input in Anatolia. Above I asked Dienekes whether the recent admixture in the extant Altaic groups of Central Asia/Siberia has rendered them more Caucasoid or more Mongoloid than they were during the Seljuqid times and before, and he replied by saying "that is hard to tell, but given that the expansion of Turkic languages followed an east-west trajectory, I'd think that the main trend would be increasing West Eurasian admixture." Then I drew attention to the fact that most of the southern half of Central Asia was Turkicized only during the last 1000 years, which must have increased the Caucasoid admixture in many Turkic groups of Central Asia during the last 1000 years. Of course, possible future analyses of ancient DNAs from Central Asia will probably give the most conclusive answers on the genetic history of Central Asia. Poor Turks here. Just trying to stick to any explanation, how implausible or irrational it may be, just so not to have to conclude that 'proto-turks' were mongoloid, which would mean that they and their ancestors are NOT. Bow down for science and swallow it. A00 at FTDNA2012: history in the making?